Los Angeles Unified School District officials are asking thousands of service workers to help them avert a strike, one that members of the Service Employees union Local 99 began voting on this week. The group includes custodians, cafeteria workers, special education assistants and other peri-educators, who say that after a year of negotiations, no significant movement has been made on key issues, including wages and staffing shortages. “In fact, SEIU Local 99 has filed charges against the District for bargaining in bad faith,” said union members in a recently released statement. The union has accused the district of cutting hours of special education assistants and under-staffing janitorial services at schools. The union also wants the district to increase its proposed 2 percent wage hike offer. “To hold the District accountable, our bargaining team is asking us for the authority to call for a lawful strike should the district continue to bargain in bad faith and continue to present proposals that disrespect the value we bring to the District. The District continues to depend on a largely part-time work force to provide critical support services, including student nutrition, health and safety, and classroom support, union members said. “Additionally, after school programs and parent training, which are proven to increase graduation rates, are in dire need of expansion. Career ladder opportunities to hire more teachers from our local school communities have not been funded in years. And while we’ve worked with the District to lift the wage floor at LAUSD, many of the District’s most experienced, long-time workers still struggle on wages that have not kept up with the rising costs of living,” they said. Concretely, adequate staffing, fair wages, better training and education and “safety and respect” are what the union is fighting for. “We have a solid offer of a 2 percent ongoing raise for the 2017-18 school year, adding seven extra work days or their equivalent for this school year, creating a $1 million cleanliness fund, and allowing for economic reopeners that allow the parties to come back to the table if our economic situation improves in the 2018-19 or 2019-20 school years. “We encourage SEIU Local 99 to continue working with us at the table to find solutions that take into account our economic reality,” Khoury said. 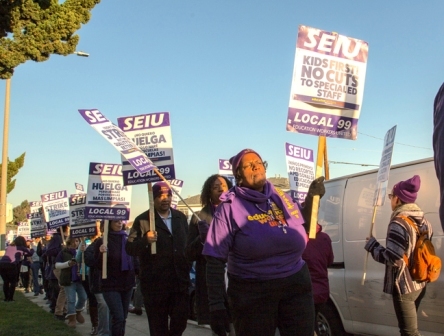 “We trust that SEIU Local 99 will follow the law and will not declare a strike before going through all the statutory mandated procedures, including mediation and fact-finding. Voting will take place at select work sites across LAUSD through Friday, March 23. Schools where voting is scheduled to take place will be posted on the union’s website daily along with the time members can cast their vote.